The Craters of the Moon in Idaho was formed by volcanic eruptions about 15,000 years ago. The National Monument and Preserve offers a fascinating glimpse into the state's dramatic geological past with a vast landscape of hardened lava. The landscape may seem barren, but there is a large population of creatures and birds here. Calvin Coolidge described the park as 'a weird and scenic landscape peculiar to itself'. While it may not look exactly like the moon, the similarities were enough to encourage Apollo 14 astronauts to use it to prepare for their lunar expedition in 1969. 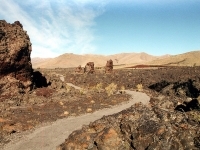 Today visitors can take the Loop Road to most of the interesting sites, including the North Crater Flow, Devil's Orchard, Inferno Cone, the Tree Molds, and even lava tube caves. Craters of the Moon is located about 178 miles (286km) west of Boise.